Daingerfield QB Tyler Boyd hit Keyarris Garrett for a 69-yard touchdown with 26-seconds left in the game to lift the Tigers to a 33-27 victory over Cameron Yoe. The win gave Daingerfield the Class 2-A Division I State Championship, and their third-consecutive state title. Click "more" for the entire 2010 All-Smoaky.com H.S. Football Team. 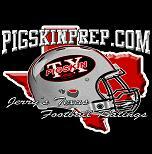 The 2010 All-Smoaky.com East Texas Polls will be released later this week in our forums section. To view all of the nominations, click "more."